I am a follower of YAHUVEH, YAHUSHUA and the Holy Spirit SHKHINYAH. Via AMIGHTYWIND. Someone e-sent me this Blog, which I am grateful for their thoughtfulness. But, this Message does not convince at all that the Holy Spirit is Feminine. 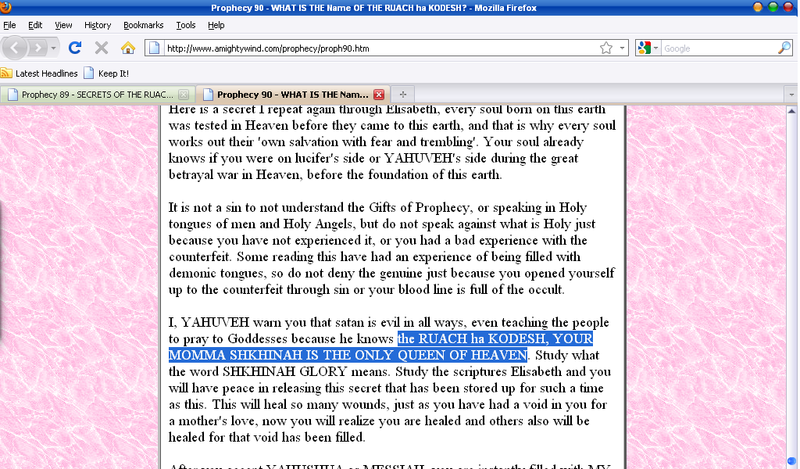 Yes, the apostate Jews/Hebrews worshipped a “queen of heaven”, but, it clearly was not the RUACH HA KODESH whom they were worshipping as the “queen of heaven”. Their goddess was that of the likes of pagan goddess conjured up by Satan himself, as an imitation of the True Queen of Heaven SHKHINYAH Glory. It is not hard to understand, once you accept the Femininity of the HOLY SPIRIT. You begin to see how mankind truly was made in the Image and Likeness of the Triune GOD-Head. Three Persons (Father, Son and Holy Spirit) in One Unit we call “GOD” and likewise….three persons (father, mother and child’ren’) in one unit we call a human “family”. It is not heretical to call the Holy Spirit Feminine, as if being Feminine were an inferior or “less than” gender. GOD created man in HIS Image, not the other way around. We, at AMIGHTYWIND, are not creating the Holy Spirit in woman’s image…women were created in the HOLY SPIRIT’S Image. The pronouns “He” and “It” are used in reference to the Holy Spirit in the New Testament for the N.T. was translated from Greek and Greek has no feminine pronoun. The descriptions of the Holy Spirit are womanly traits: The “Paraclete”, One Who COMES ALONG SIDE ANOTHER (the woman comes along her husband as a help-mate); the “Comforter”, a very womanly, motherly trait (men can comfort, no doubt, but, it’s more strongly a feminine trait in women; the Holy Spirit does not Glorify “Herself”, but, points us to the Father and the Son “YAHUSHUA”. The human father is likewise the head of the human family’s household, the wife submits to him, AS he submits to YAHUSHUA (JESUS) as his Saviour and Lord. Prophets were never popular, and they still aren’t today. GOD’s modern Prophets exist in the Church today: EPHESIANS 4:11-12, and HE reveals HIS Secret(s) to HIS servants, the Prophets: AMOS 3:7.
this article IS NOT talking ABOUT GENDER. don’t reply to this blog. reply to those in youtube.com, let all of them hear you speak in Hebrew. I will answer your reply on this Blog, and then you can shout my reply to the rest of your world. :-) Mankind was made in the Image of GOD. GOD gave mankind the custom of taking on first names (and later on of sur-names). That is a custom after HIS Image, for each Person of the GOD-Head have Names. Those Names of the GOD-Head are Hebrew. Hebrew is a Language that GOD HIMSELF created. Created and given to the Race that HE chose to send the MESSIAH through to the World. GOD created the Language of Hebrew, do you not get that? That means for HIS Names to be Hebrew would be a NATURAL for HIM…NOT an exclusive “transliteration of HIS Names” for the Hebrew/Jewish people only”. 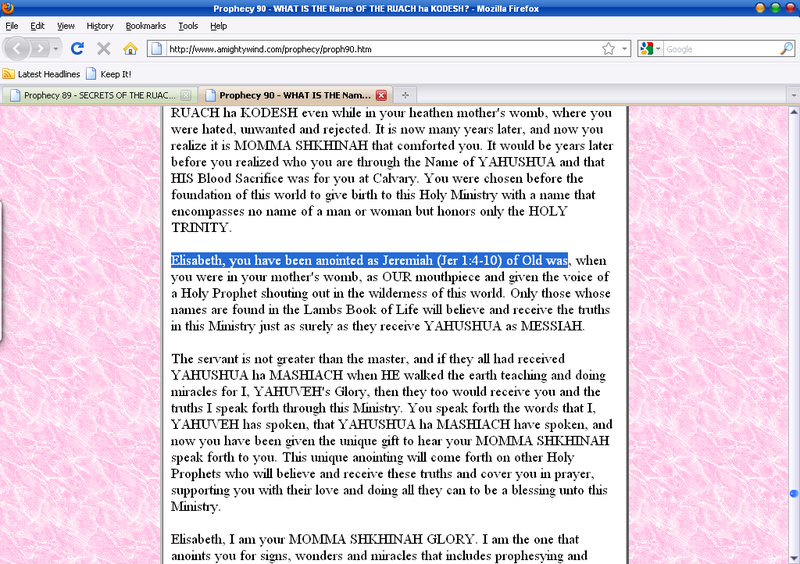 These Sacred Hebrew Names are what HE intends for ALL of HIS followers to use, both Jew and Gentile followers. For, as the Scriptures say, in MASHIACH (CHRIST) there is neither Jew nor Gentile…MEANING that both are EQUAL in the LORD, not one “better than” the other. As mankind has been created with the GOD-given custom of knowing one another on a first name basis, that is, when we relate to our loved ones, and to our neighbours around us, we call them by their first names, nick-names notwithstanding. So, likewise, it is with GOD, when we relate to GOD…HE desires us to know HIS Name(s). To relate to HIM on a PERSONAL, INTIMATE, LOVING First-Name Basis. So, HE reveals HIS Names to us in order for us to address HIM by HIS Name(s). Part of there being such a “big problem” in the Sunday-Church with the Sacred Hebrew Names of GOD is that, long ago, there were Jewish religious leaders and scribes who began to HIDE and KEEP HIDDEN the Sacred Names of ELOHIM (GOD)from the world around them for fear of HIS Name being taken in vain. So, the True Hebrew Names of GOD were “hidden under wraps” from the rest of GOD’s followers for that reason, and the Names were replaced with substitute transliterations like “JEHOVAH” and “JESUS”, so that people could have the satisfaction of calling GOD by some Proper Names without running the risk of taking HIS True Hebrew Names in vain. But, now, GOD is, through HIS holy Teachers and Prophets (EPHESIANS 4:11-12) is bringing HIS Names back to the forefront again, and THAT, for these End Times, for the Sacred Names of GOD will play a BIG ROLE during the reign of the Anti-Christ (the false “Jesus Christ”) and his New World Order. The Son of GOD “YAHUSHUA” came in the Name of His Father “YAHUVEH/YAHWEH”. 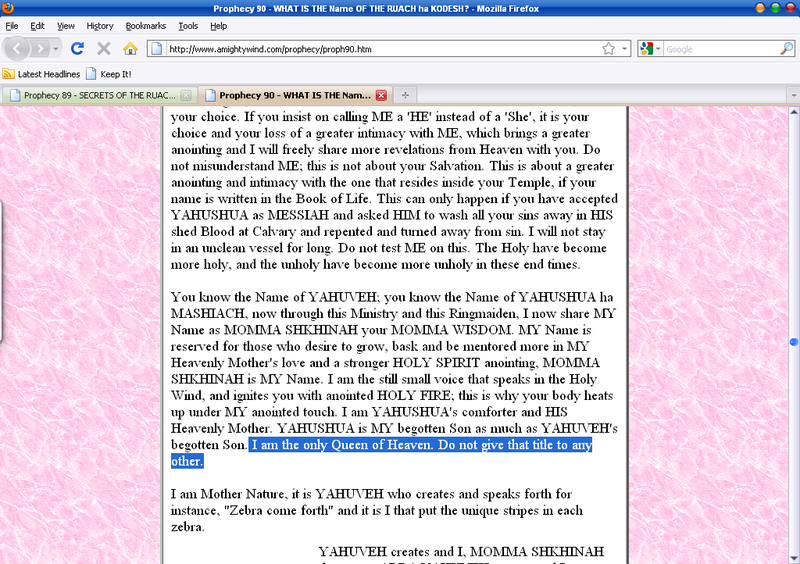 “YAH-USHUA” means “YAHUVEH is Salvation/ “YAH saves”. That there is the BIG, BIG, BIG meaning of the Sacred Hebrew Name of the Son. And, so, since our Saviour has rescued us from the burning Fires of Hell and the Lake of Fire, why would we NOT want to learn, and then use His True Sacred Hebrew Name? Does He not deserve to be known more and more fully by us for His Grace and Mercy that rescues us from the Fiery Wrath of GOD? Do we not want to call our Saviour by His True Name just by virtue of Who He is? Just as we like to learn the real first names of our human loved-ones….Is not our Lord and Saviour the most important Person we want to get to know? These are rhtorical questions, because the answers should be in the obvious affirmative. 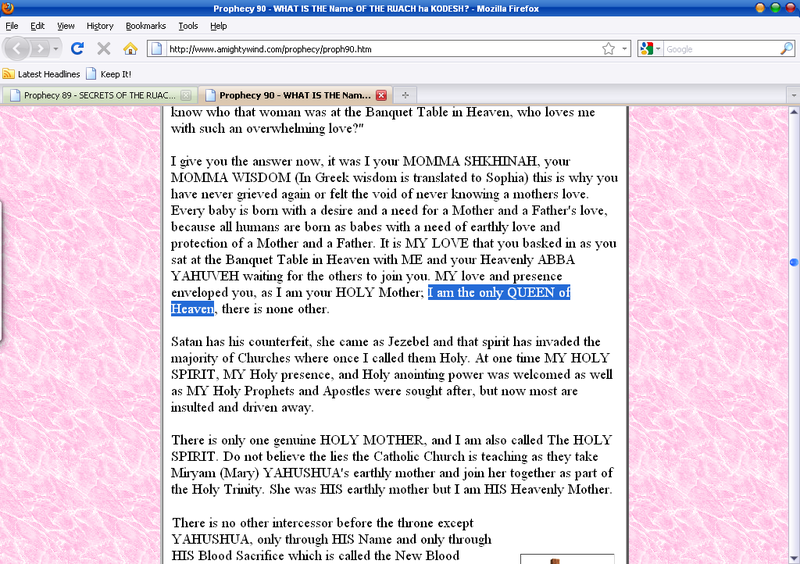 Regarding my last comment, I meant to say that this Article does NOT convince (me) that the HOLY SPIRIT is not Feminine. Once you accept Her Gender, all else of the human race, regarding the subject of it’s gender, and it’s being created in the Image and Likeness of the Triune GOD makes perfect sense. hey People. 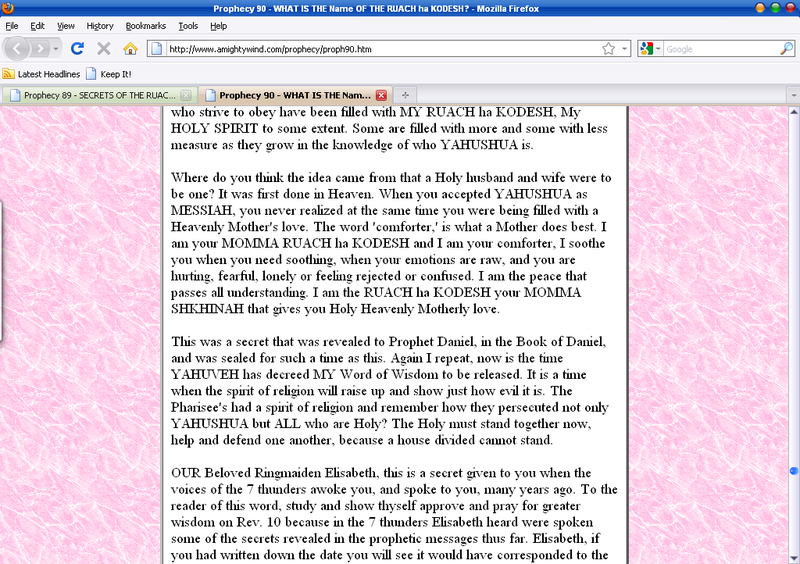 amightywind.com doesn’t understand the essence of the word “ruach” at all. if they do understand Hebrew language, they must prove it. indeed the word “Ruach” is feminine in Hebrew, but it is about feminine word, not feminine biologically. 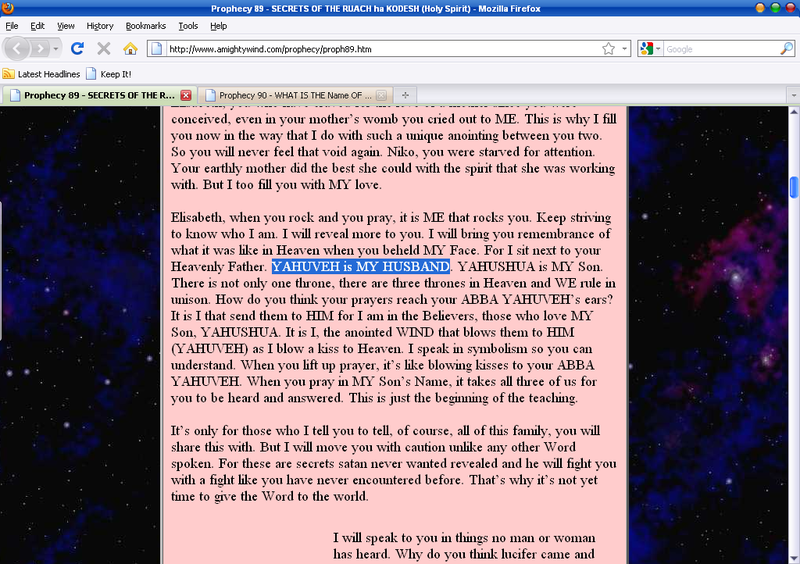 and there is nowhere in Tanach that ever says “Ruach ha Qodesh” is Yahweh’s wife. you all should have consulted with real Jewish and Hebrew native speakers before making any conclusion. so, how about Sh’ma Yisrael?? is there any marriage in Heaven? what about Jesus’ own words in Luke 20:34-36? as far as I know, there is a feminine word “hayyah” in Hebrew which means animal. does that make all animals female then?